Here's another question from one of the Quilting Biz community. It comes from Dyna, who is looking to get some basic information about business permits and advertising a new quilting business. If you are actually running the business from your home are any type of permits required from the city or state? What is the best way to advertise your business when it is a new start up? Business Checking Account – For the most part, if you want to have a legitimate business, you will need to have a separate checking account for that business. This is done to make sure you are not mixing personal and business funds, and it makes it easier for an auditor to sort out what are legitimate business expenses. And, it makes your life easier at tax time when you're trying to find out how much your new business made (or lost) in order to fill out your tax returns. Taxpayer Identification Number – This is the number the government uses to track your business. For a sole proprietorship, where you are the only employee of the business, this is usually your social security number. If you are going to have employees, you will need an Employee Identification Number (EIN) that is obtained from the federal government. Business Permit – Depending on your location, you are going to need to file with your town or county (or perhaps state) that you are operating a business out of your home. For example, in my town, I needed to go down to my Town Hall and file some paperwork (and pay a $25 fee) and tell them what type of business I was opening. Depending on what type of business you intend to operate, there will be zoning regulations that may or may not permit you to open that type of business out of your home. For example, if you wanted to open a small quilt shop in your home, and your home is zoned as a residential area, then you won't be able to open your business legally and will need to find some retail space nearby. Those are the basics. Obviously, you should consult an attorney or business accounting professional if you have any questions about the regulations in your city or state. You should be able to find a knowledgeable legal resource in your local newspaper. The next part of Dyna's question is about advertising her new quilting business. Advertising, or promotion, of your new business is key to getting off to a running start towards making your business successful. And, there are a number of different methods you can use to get that good start. Free Publicity – This is the most effective method of getting your word out to a large audience as quickly as possible. Newspapers must fill up their pages with news either each day or on a weekly or bi-weekly basis. This is not as easy as it sounds as the newspapers want to make sure a lot of their coverage has a local angle. The people who buy the local newspaper do it to find stories about their area as they can get national and international news from TV and the Internet. So, newspapers are always happy to cover new businesses in the area. The trick is to try and make the story as compelling as possible, and to give the editor or reporter something that they can sink their teeth into. Try to think of a special reason you are opening your business, or a special person who brought you into quilting. Human interest is always a good story. Referrals and Word of Mouth – One of the most powerful promotion methods you can cultivate is word of mouth, or referrals. When someone talks about your business to a friend, that person is much more likely to look favorably on your business than if they had seen an advertisement. That's because we typically trust the advice of our friends, especially when we know them to be trustworthy. Your job is to make your business stand out, and to make it easy for customers to pass the word along. Give them plenty of business cards to hand out to people they think would be interested. Let them know that the best way of saying “Thank You” to you is to let someone else know about your quilting business. Once the word gets out about the quality and service you provide, more and more people will want to tell their friends about your business. Partner Marketing – Is there a business out there that is complementary to yours? For example, if you make custom quilts, you could talk to all the interior decorators in the area about your services. They may have a client that needs a custom quilt to finish off one of their rooms. Or, if you are a longarm quilter and there is a quilt shop in the area, you can see if they will let their quilters know about your services. You can even work out a referral program where you give them a portion of a sale or a flat fee. There are lots of ways to promote your business, but the three methods above are free or low-cost, are very effective, and will help you get your business off to a good start. Of course, you'll want to start the promotion well before your Grand Opening, as you can use the opening as part of your promotion plan when talking to the local paper. I want to start my own business, but I am very nervous about getting going. I want to do everything right, but I also want to make money. All very confusing and any help anyone can give me would be totally appreciated. I started my business in my home. Besides the city/town and state, I also have an home owners association that restricts some businesses in the home. As long as I do not put a sign in my yead and have a parking lot, I can have my machine quilting business in my home. 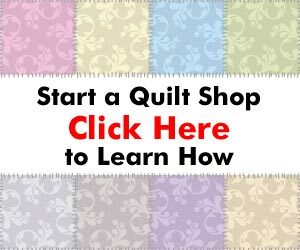 I have also contacted a local quilt shop, for customer pick up/drop off site.